It’s not every day that you get a visit from God. Burning bushes, ladders to heaven, chariots of fire and all that–we look for those stories in the Bible, and we look for them in our lives. When it comes to something as important as what we do with our lives, we think, maybe God owes us a big event. But, as Leroy Barber has learned through his work in inner cities and with young people, that’s not usually how it works. More often God calls out to us from everyday misfortunes and all-too-common injustices, and he invites our response–not just a response in the moment, but a recognition that we have a role to play in seeing God’s kingdom come, God’s will done, on earth as it is in heaven. Through the surprisingly normal stories of the heroes of faith in the Bible, and through Barber’s experiences with Mission Year and other ministries, in this book you’ll learn what it means to change the world from your own little space in it. "Some of the best things in church history, and some of the worst, have been done in the name of 'missions.' It's one of those words we need to dust off, reclaim and re-envision so that we are spreading the real gospel―not the white man's gospel, not the prosperity gospel, not the American gospel, not the fluffy, do-it-yourself gospel, not the empire's gospel or the colonialist's gospel―but the gospel of Jesus, the gospel that is always good news to the poor, the gospel that comes with a cross and an invitation to suffer alongside those who suffer. Leroy Barber is at the forefront of reimagining what missions looks like in the twenty-first century. 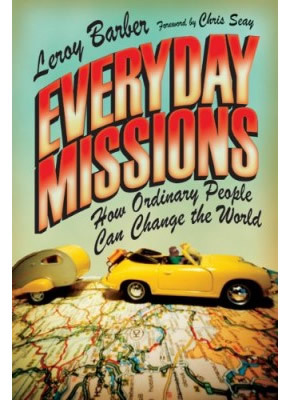 He helps us see missions not just as something we do with our mouths but something we do with our lives." "Leroy Barber dreams big dreams for our generation―dreams that have the power and potential to change the world forever. This book will inspire anyone who wants to move beyond the ordinary toward an extraordinary life lived for God."